This is the ‘green’ print for your ideal designer garden. 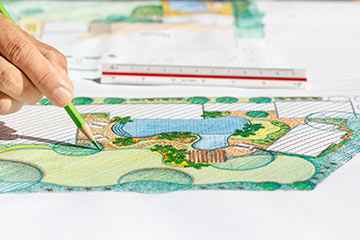 Envision the plants, trees, flowers, patio and paving, and then sketch a design to complement your home and give you that amazing outdoor space you’ve been dreaming of. Think about where the sun filters in through the trees (if any), where it blazes down, how the shade crosses the garden, and how much water you plan on using for the upkeep. These factors influence the types of flowers, plants and trees you’ll use, the design of your garden, and will give you a good idea of what to budget for. Every sprout of green grass is an indication of life flourishing in a bleak wilderness of fallen leaves and twigs. Now is the time to rehabilitate those sprouts and turn them into a lush carpet of soft, manicured lawn. Find out the type of grass that is coming through, buy grass seeds (or buy grass), and get the correct soil mixture, mulch and fertiliser. Aerate the soil and you’re off to a good start. If your grass is already established, but you feel that your garden needs a pick-me-up, landscapers suggest using attractive outdoor vases and pots. Choosing the right pot can make or break the look and feel of your garden and the aesthetics of your home. With this in mind you want to choose something that is going to suit your style while accommodating your selection of flowers and trees to shade you from the blazing summer sun. On the subject of summer, you need to take it easy on water usage during these hot months, so you should consider installing a self-watering drip irrigation system. A simple yet effective setup, the self-drip appliance prevents your lawn, plants, flowers and trees from dehydrating, particularly in smaller pots that use little soil. With the right watering system in place you can choose any size pots and vases. From contemporary to traditional designs, these versatile vessels are available in all shapes and sizes. They can accommodate hardy trees such as Yuccas and palm trees, or stunning rose bushes that complement your patio or garden path. A lovely addition to any front or back garden. A sloping garden is an annoyance for most homeowners. If you’ve got this issue, there’s hope yet. Retaining walls are popular because you can flatten the garden area and retain the excess soil behind the structure. You can then incorporate the wall into your garden design, using different materials to complement the space. Made from concrete, wood or boulders, retaining walls not only need to follow function, but they can also follow a stylish form that complements the look and feel of your outdoor area. With the right style and materials, designer retaining walls can become a focal point in your garden. Manicured pathways add a sense of order to any garden. It’s up to you to decide which style best fits what you have in mind. Your back garden may have some limitations such as a high water table, so you will need to choose slabs and tiles that can work within these restrictions. Some paths, like those with mosaics and cobbles, will require maintenance, while others such as slats or gravel, can be laid anywhere with minimal labour and fuss, and don’t need to be regularly maintained. You can also integrate a path into your already perfect garden, adding something new, but using existing features. If you decide you need a path to run along the base of a retaining wall, you could use the same modular bricks or slats so the path seamlessly integrates with the wall. It looks clean and injects more structure into the setting. Pathways can be rugged, structured, rustic and ultra-modern. They’re a stunning addition to any outdoor space, giving it dimension and charm. Spring and summer are the ideal seasons to get stuck into your garden because the weather is great and the ground fertile. Some ideas are small, while others require a bit more labour and thought, but with the right ideas and designs you’ll see your vision come to life. If you require assistance with larger projects such as retaining walls, contact Wonderwalls, the preferred retaining wall suppliers and installation experts.